Hinshaw Archibald, age 24, born in North Carolina; single; farmer. Hinshaw, Arch, age 28, born in North Carolina; keeps toll gate; $1400 real estate; $300 personal property. Hinshaw, Susan, age 25, born in Indiana. Hinshaw, Rebeca, age 5, born in Indiana. Hinshaw, Martha, age 2, born in Indiana. Hinshaw, Mary, age 7 months, born Oct  in Indiana. Hinbshaw, Arch, age 39, born in North Carolina; parents born in North Carolina; keeps toll gate. Hinbshaw, Susan, wife, age 35, born in Indiana; parents born in Ohio; keeping house. Hinbshaw, Rebecca, daughter, age 15, born in Indiana; father born in North Carolina; mother born in Indiana; attended school. Hinbshaw, Martha A., daughter, age 12, born in Indiana; father born in North Carolina; mother born in Indiana; attended school. Hinbshaw, Mary E., daughter, age 10, born in Indiana; father born in North Carolina; mother born in Indiana; attended school. Hinbshaw, William, son, age 8, born in Indiana; father born in North Carolina; mother born in Indiana; attended school. Hinbshaw, Ada C., daughter, age 6, born in Indiana; father born in North Carolina; mother born in Indiana; attended school. Hinbshaw, Daisy, daughter, age 2, born in Indiana; father born in North Carolina; mother born in Indiana. 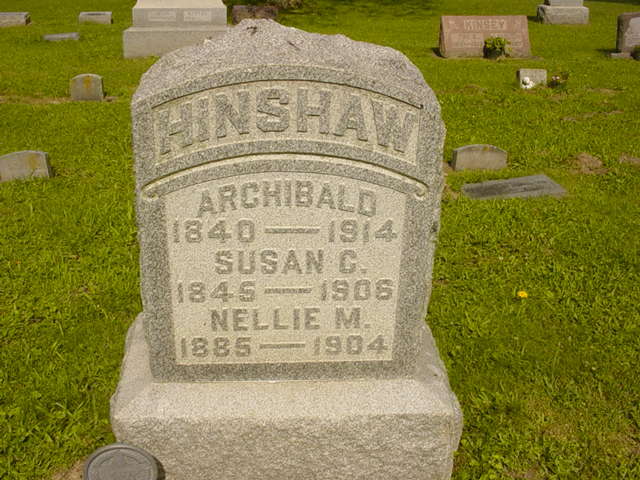 Hinshaw, Arichoble, head-of-household, age 59, born July 1840 in North Carolina; parents born in North Carolina; married 36 years; occupation: farmer; rented farm. Hinshaw, Susan, wife, age 54, born January 1846 in Indiana; father born in Ohio; mother born in Indiana; married 36 years; 13 children, 12 living. Hinshaw, Ad. C., daughter, age 26, born Dec 1873 in Indiana; father born in North Carolina; mother born in Indiana; occupation: house keeper. Hinshaw, Fannyllian, daughter, age 17, born Nov 1882 in Indiana; father born in North Carolina; mother born in Indiana. Hinshaw, Nelly May, daughter, age 15, born March 1885 in Indiana; father born in North Carolina; mother born in Indiana; attended school 5 months. Hinshaw, Ethel L., daughter, age 12, born June 1887 in Indiana; father born in North Carolina; mother born in Indiana; attended school 6 months. Hinshaw, Clarence A., son, age 9, born July 1890 in Indiana; father born in North Carolina; mother born in Indiana; attended school 7 months. Brake, Lenard, hand, age 15, born Nov 1884 in Indiana; father born in Germany; mother born in Indiana; occupation: "farmer labor". Henshaw, Archibald, head-of-household, age 69 [unclear], born in North Carolina; parents born in North Carolina; widower; occupation: own income; owned home (free). Henshaw, Addie, daughter, age 38, born in Indiana; father born in North Carolina; mother born in Indiana. Henshaw, Clarence, son, age 19, born in Indiana; father born in North Carolina; mother born in Indiana; occupation: laborer; attended school. RootsWeb WorldConnect data by Jane Holman (). 1870 census, Greensfork P.O., Green Township, Wayne County, Indiana; roll M593-370, page 356, line #26, dwelling #153, family #160. 1880 census, Green Township, Wayne County, Indiana; roll T9-0321, ED 55, page 46A, line #32, dwelling #167, family #167. Rebecca Arminda Hinshaw death certificate. 1900 census, Washington Township, Randolph County, Indiana; roll T623-399, ED 128, page 3B, line #80, dwelling #71, family #72. 1910 census, Greene Township, Wayne County, Indiana; roll T624-387, ED 170, page 2B, line #65, dwelling #41, family #41. Contribution from L. A. Cranor (). Indiana Work Projects Administration; book H-1, pg 49. Indiana Work Projects Administration; book H-1, pg 222. Indiana Work Projects Administration; book H-2, pg 18. Indiana Work Projects Administration; book H-2, pg 84. 1850 census, Upper Regiment, Chatham County, North Carolina; roll 624, pg 383, family #481. Indiana Works Progress Administration, 1941; book H-30, pg 101. U.S. Civil War Soldiers, 1861-1865; http://www.ancestry.com. Photo courtesy of Jackie L. Wolfe.